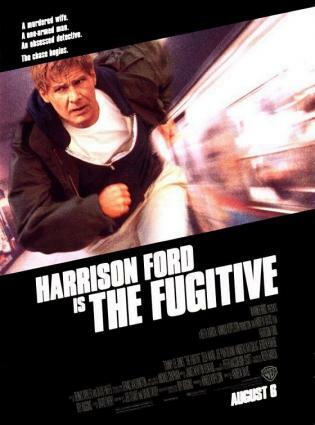 One of the most successful of the movies based on a TV show, 1993's The Fugitive combines a headlong plot, a tight script, and well-nigh perfect casting. Adapted from the popular 1960s television show starring David Janssen as the titular Fugitive, the movie version tightens the time frame and broadens the cast, adding eye-popping special effects. "Falsely Accused of a Murder He Did Not Commit..."
Harrison Ford stars as Dr. Richard Kimble, a successful surgeon deeply in love with his rich and beautiful wife (Sela Ward, seen primarily in flashbacks). Kimble's life turns upside down when he returns from an emergency surgery to find his wife brutally murdered and a mysterious one-armed man fleeing his house. Skeptical police investigators don't believe Kimble's story of the one-armed man, his wife's wealth gives him a motive, and her dying 911 call appears to be a direct accusation. The circumstantial evidence is overwhelming and Kimble is convicted of murder and sentenced to death - all before the credits roll. On the way to prison, a bus crash (combined with probably the most spectacular train wreck ever filmed) sets Kimble free, and now he's on the run. Not just on the run, but on the trail of the real killer. Enter Federal Marshal Sam Gerard (Tommy Lee Jones), the relentless pursuer who comes close to putting this movie in his back pocket and walking off with it. Gerard takes over from the local authorities at the crash site who are convinced all the prisoners are dead, and set out to track Kimble. Unlike the television show with its lone pursuer, Gerard is the head of a team of competent investigators. While fans of the television show carped about the change, the warmth and cameraderie of the band of marshals makes a dramatic counterpoint to Kimble's solitary and precarious condition as both hunter and hunted. The justice system has failed him and he can rely on no one but himself. Kimble eludes the marshals and goes to ground. Investigating Kimble's life and murder conviction, Gerard begins to see problems in the case. Now he not only has to find Kimble and bring him in, but get to him before the local police do. And before the real killer does. Kimble's run and his investigation to find the real killer remind us that he's not just a victim. He's a doctor, and a smart one. He can use his specialized knowledge to track the one-armed man through a database of prosthetic arms, and he must not only find the one-armed man but find out the motive, the real villain behind the murder. 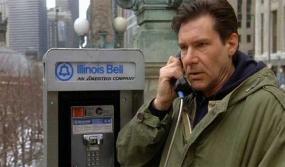 Because this was not a crime of random violence, and the real target wasn't Mrs. Kimble at all - it was Kimble himself. The cat and mouse tightrope act of eluding Gerard while leading Gerard to the clues about the real criminals adds to the tension of a highly effective plot. Directed by Andrew Davis, The Fugitive was an Oscar nominee for Best Picture, and won Tommy Lee Jones an Oscar for Best Supporting Actor. David Twohy and Jeb Stuart wrote the screenplay based on a story by David Twohy and characters created by Roy Huggins. The Fugitive is a thinking viewer's thriller, a movie you can watch for the excitement without having to ignore huge gaps in logic and plotting.